In many spheres - chess for example - they could utter these lines to us humans today and there's nothing we can do about it - for the computer is right. The puniest of computers in the tiniest of smartphones possesses enough computing horsepower and smart-enough algorithms (written by us humans - oh yes, the irony!) to defeat the best of us humans in chess, every single time, without breaking a sweat. Computers have been able to add, subtract, divide, square, multiply faster and more accurately than us for decades now, and there's nothing we can do about that either. From the time of the Luddites - who rose up against the machines of the Industrial Revolution in the early years of the nineteenth century - to the present-day "Judgment Day" Sarah Connor avatars, inspired as much by an acute awareness of the march of technology as by James Cameroon's "Terminator" movies, the refrain of the chorus has been more or less unchanging: the machines are coming for our jobs, our livelihoods, and will finally come for us (the Matrix was premised on a variant of one such dystopian future). Computing power of computers exploded in the second half of the twentieth century, obeying the inexorable pull of Moore's Law, and made feasible by advances in semiconductors, fabrication techniques, and electrical engineering. As did fears that similar software advances could somehow endow machines with intelligence - Artificial Intelligence. These fears however did not quite come to pass. For several decades, there were several false hopes and starts that were kindled and then extinguished. Till this decade. The congruence of seemingly infinite computing power - thanks to massive server farms running in the "cloud" (a mangled metaphor if ever there was one), cheap and lightning fast bandwidth available on tap, storage and memory that keeps getting impossibly cheaper every year, and sophisticated software algorithms - has however made it clear that "machine intelligence" is no longer an oxymoron. We are well and truly living in the middle of the machine age. The "singularity" may well be witnessed in our lifetimes, within a decade or two even. 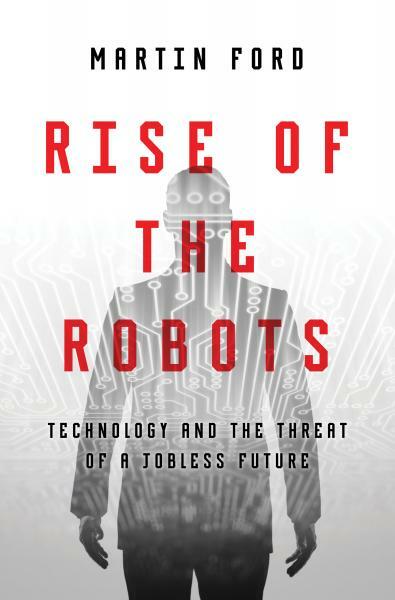 Martin Ford's book, "The Rise of the Robots: Technology and the Threat of a Jobless Future" lays out the case for a not-so-distant future where machines make possible the automation of almost every task imaginable, but at a great social and economic cost. The book is neatly organized, lucidly argued, and except for a lengthy and somewhat incongruous chapter on the medical system, the book stays on point. Ford makes it clear that neither is this technological progress reversible, nor wholly desirable. Its consequences therefore cannot be wished away - income inequality as an example, which economists for three decades have been explaining away as a temporary anomaly. The last section, which is more contemplative and prescriptive, as opposed to the earlier sections which are descriptive, discusses possible solutions, some of which will shock free market proponents. Whether there are more practical, workable answers is quite another thing though.